Dr. Marsh Cuttino is an Emergency Medicine physician in Richmond, VA. He is board certified in Emergency Medicine and a Fellow of both the American Academy of Emergency Medicine and the American College of Emergency Medicine. He was an assistant professor of Emergency Medicine at Virginia Commonwealth University. He has worked at NASA as a launch and landing support physician for the Space Shuttle. He is active in microgravity medical research and has flown multiple campaigns on the NASA Parabolic Flight Laboratory, the "Weightless Wonder"
Orbital Medicine has designed a patch for Dr. Kovacs’ October flights at his request. The patch is designed to showcase the Stanford colors and the cardiac electrophysiology that is going to be a portion of the research flight. 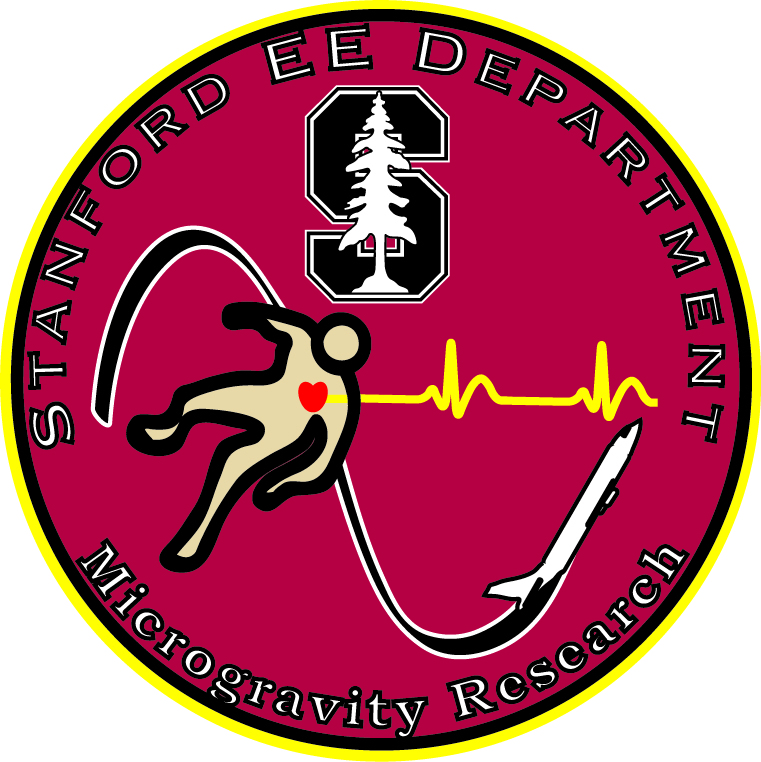 The flight patch designed by Orbital Medicine for the Stanford EE research flight. 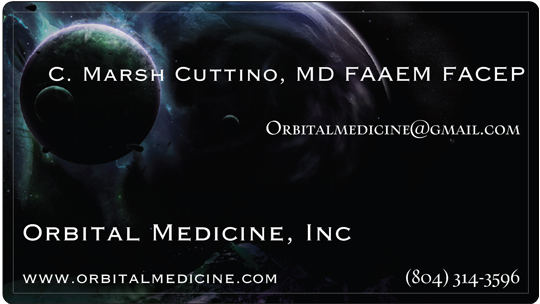 Dr. Cuttino and the Orbital Medicine, Inc (Richmond, VA) team will be assisting Dr. Greg Kovacs and his team from the Stanford EE department in parabolic flight testing aboard the NASA RGO Parabolic Flight Research Aircraft the first week of October 2012. Dr Cuttino is serving as the medical team lead and consultant, as well as supervising the IRB process for the experiment. The experiment is to evaluate a ballistocardiograph in the microgravity environment and was awarded a NASA Flight Opportunities Grant. 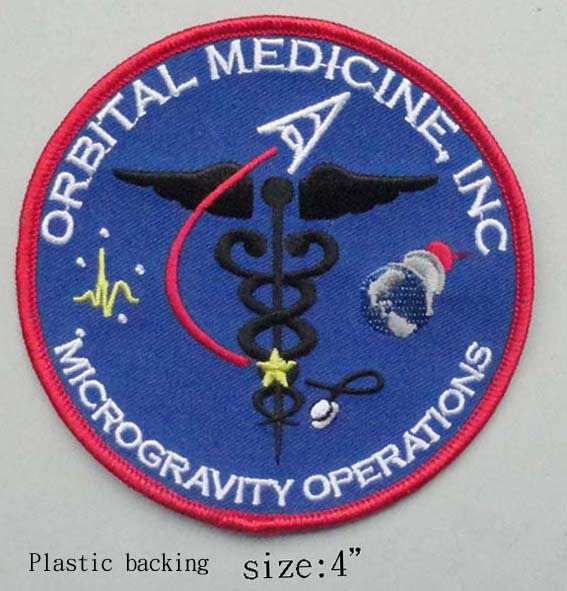 This will be the second Parabolic Microgravity Flight Campaign for Orbital Medicine in 2012. Orbital Medicine had a successful field test of the prototype structure for a medical chest drainage device today. The flight test took place from Ellington Field, TX with the NASA Reduced Gravity Office. Flown on the Zero G 727-200 parabolic aircraft, the device was tested under lunar and zero gravity conditions. The first tested configurations successfully separated the simulated blood from the air under both gravity conditions and would provide an effective treatment of a pneumothorax in an emergency. Further flight testing on additional configurations will continue through the end of the week. Two flight are planned for Thursday, weather permitting. The Orbital Medicine research project has passed the NASA flight readiness review and has been loaded on the Zero G corporation 727-200 in the flight configuration. Should the weather hold out with a visible horizon tomorrow the chest tube drainage system will have it’s maiden microgravity flight thanks to NASA Flight Opportunities and the NASA Reduced Gravity Office. Dr. Cuttino will be joined by Dr. Shawn Borich, and Dr. Greg Kovacs on the flight tomorrow. Ground support will be by Richard Wiard. Technology Readiness Level (TRL) is a measure used by NASA, some United States government agencies and many of the world’s major companies (and agencies) to assess the maturity of evolving technologies (materials, components, devices, etc.) prior to incorporating that technology into a system or subsystem. Generally speaking, when a new technology is first invented or conceptualized, it is not suitable for immediate application. Instead, new technologies are usually subjected to experimentation, refinement, and increasingly realistic testing. Once the technology is sufficiently proven, it can be incorporated into a system or subsystem. TRL 7 is a system prototype in a space environment, and TRL 8 is an actual system completed, and “flight qualified” and evaluated for the space environment. In space the lack of gravity has an often-unexpected influence on devices and their operation. Many devices that were developed for the terrestrial environment will simply not work in zero gravity. By having experienced researchers to assist with the development of your product, we can help insure a smoother testing and development phase. Just as the factors of microgravity significantly change the operation of the device, when the device changes the effective weight during acceleration, unforeseen consequence can occur. An example from my own research demonstrates that the safety devices on IV needles will spontaneously fire during a hypergravity load of as little as 1.5 g, rendering them useless for gaining IV access.